*Target customers based on DEMA’s Go Dive Now Campaign marketing research. **Addresses are available to DEMA Members only for a nominal fee. 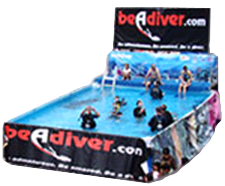 Promote your professional dive center or destination to consumers interested in learning to dive. Preferred Member listings include a priority ranking, description, map and company logo. Members are able to order and download complimentary Go Dive Now campaign logos, images, and design templates, including everything from web banners to customizable videos. Templates can be easily customized to include your business's name and information. Before getting started, Members should first review the Go Dive Now Logo & Website Use License Agreement. Ready to start your marketing campaign, but need help with where to start? DEMA can help you! In the web world of today, social media has become a key component of public relations and one that members of the diving industry can affordably use to grow their businesses. Find out more in this helpful guide. Access to Industry and Consumer research and demographics. 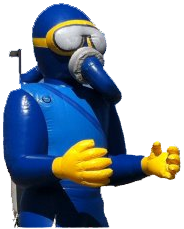 Catch the eye of local customers with DEMA's "Blow Up Diver," aka B.U.D. This 10-foot display is a great promotional tool to attract customers and get them in the door and is FREE for Members to use! The Industry’s premiere traveling diving experience program! New divers are able to experience the sensation of diving in a safe and controlled environment staffed by YOUR employees. In other words, you are part of their first diving experience and have a prime opportunity to develop a long lasting relationship with them. Realizing that encouraging young people to get involved in diving is vital to the future of the industry, its business and the marine environment, DEMA has created the Deep Ambitions Aquatic Career Fair in affiliation with DEMA Show. A means for students to learn more about the opportunities affiliated with the marine environment and diving, the Fair features hands-on exhibits, industry affiliated speakers, the opportunity to try diving with DEMA's Go Dive Now Pool Tour and more! Retired vessels can be given new life as artificial reefs. Once cleaned, vessels can be "diver-ized” (made easily accessible to divers) and purposefully sunk as artificial reefs. These projects are economically beneficial to the local community, environmentally responsible and an enhancement to local diving opportunities. DEMA can help by providing information and networking opportunities for those interested in such projects.